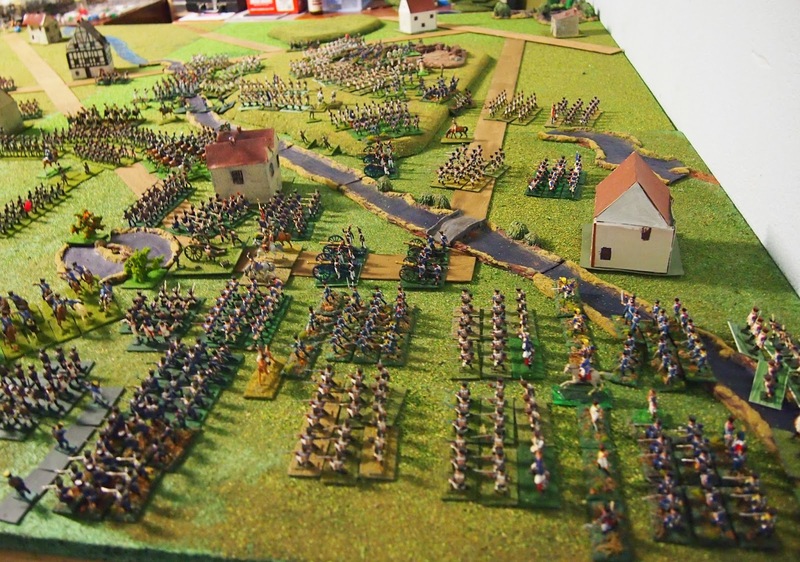 Oudinot had captured Mehltheur and Reischen, driving in the weak, lead divisions of Eugene de Württemburg’s corps. 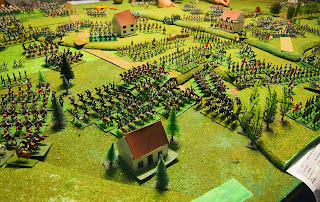 Beside him, MacDonald had been engaged in an arm wrestle with Berg’s Russians around Jenkwitz and Bonnet’s division of Marmont’s corps had begun the attack on von Yorck’s Prussians, who were defending around Baschütz. In the north of the battlefield Marmont’s two other divisions (Friederichs supported by Compans) and Bertrand’s corps attacked Blücher’s defensive line Litten-Klein Bautzen-Kreckwitz Heights. 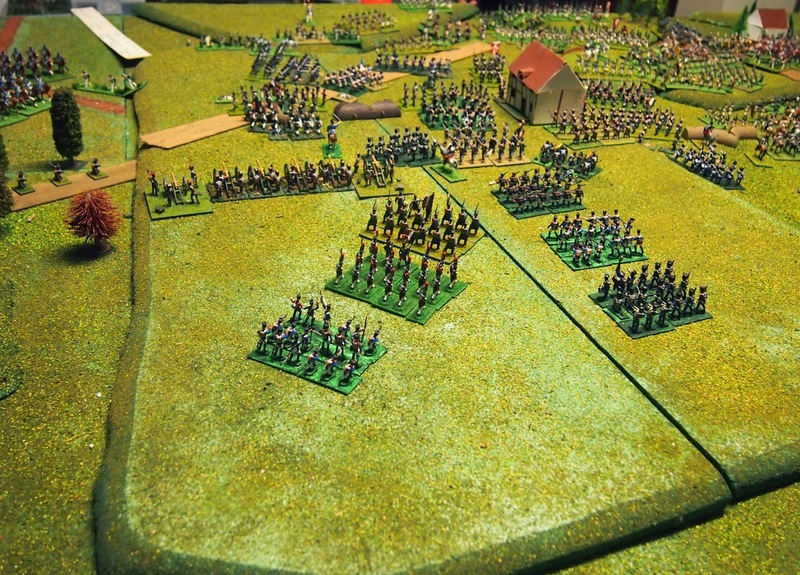 The lead elements of Ney’s wing of the army (Souham’s division of Ney’s IV Corps) arrived around Preititz. 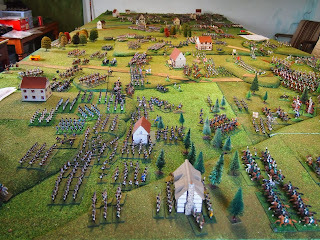 We picked up the game at the beginning of Turn 10 (11:30). The action re-commenced with a mixture of small victories and losses for each side. 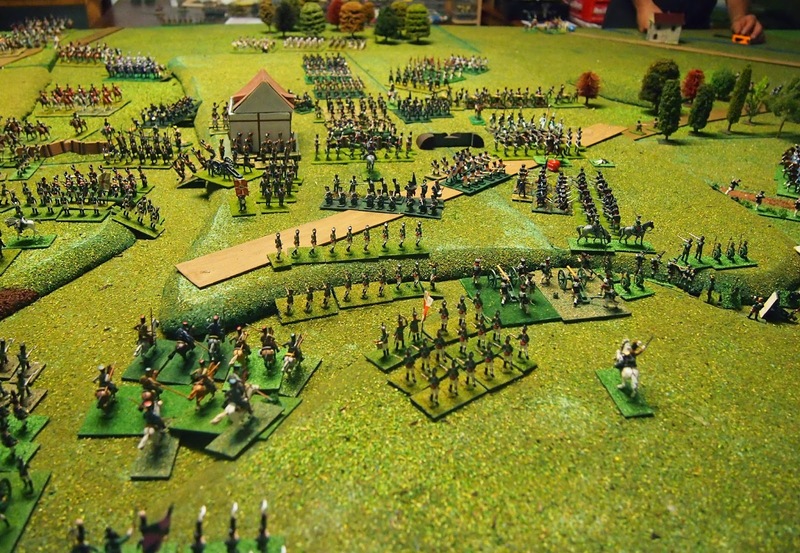 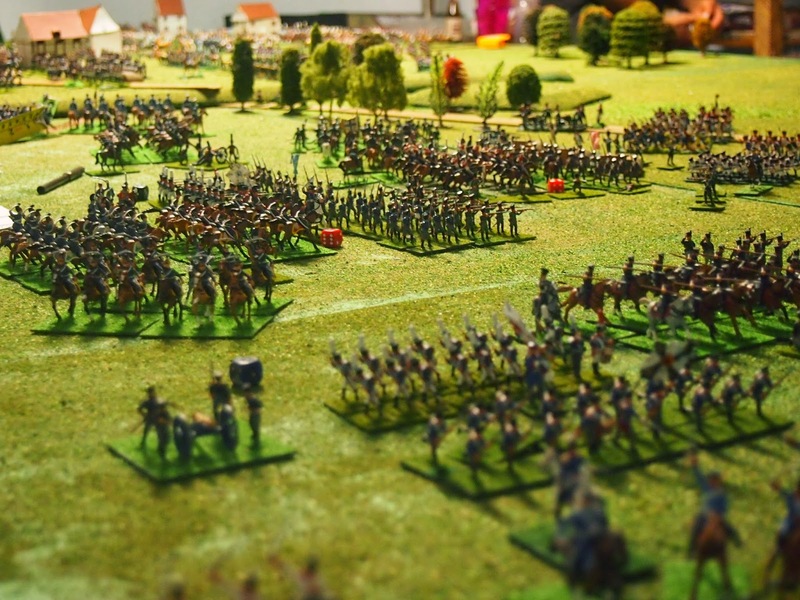 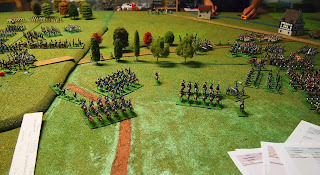 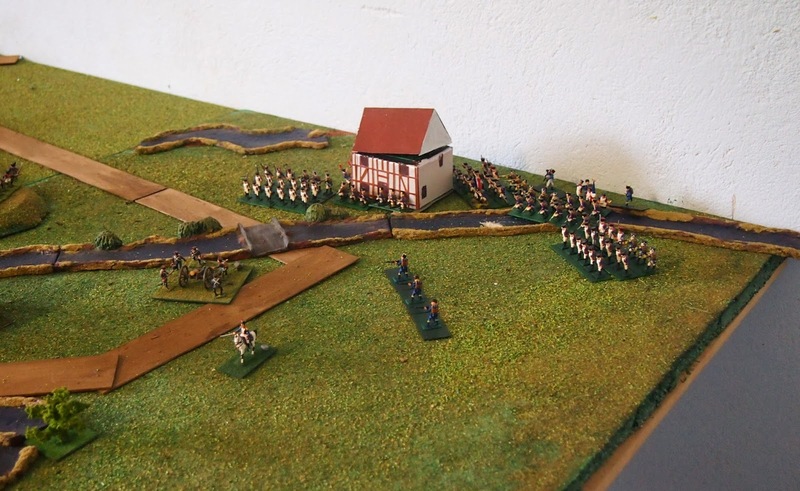 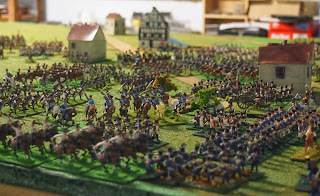 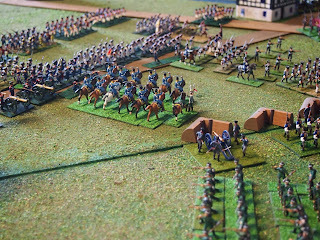 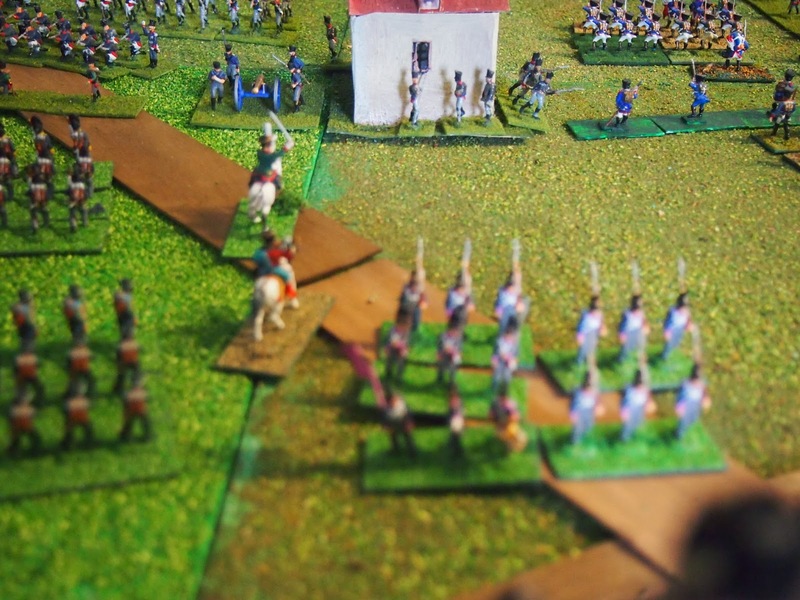 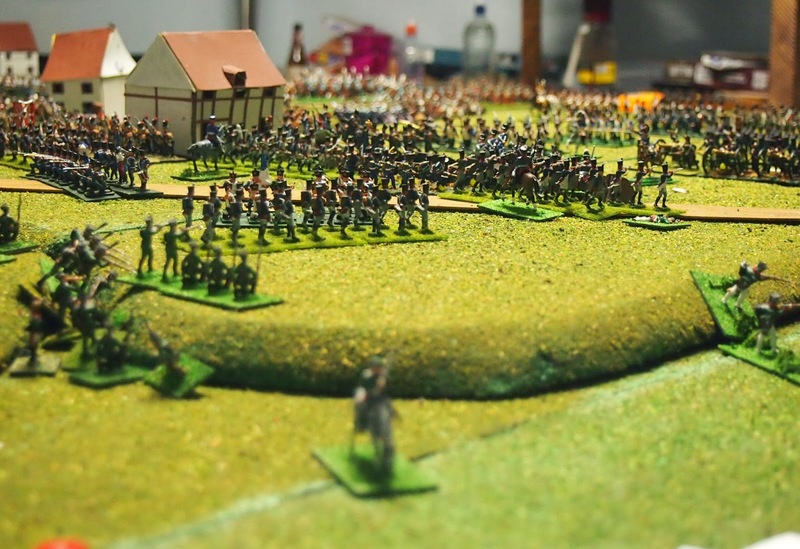 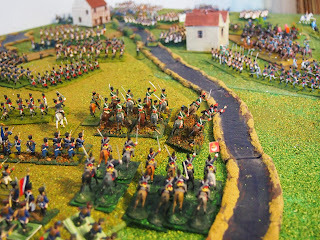 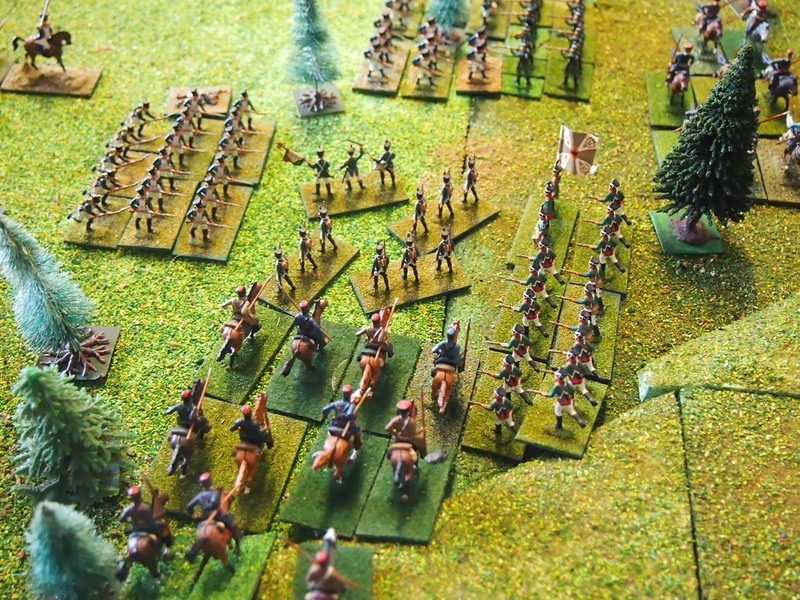 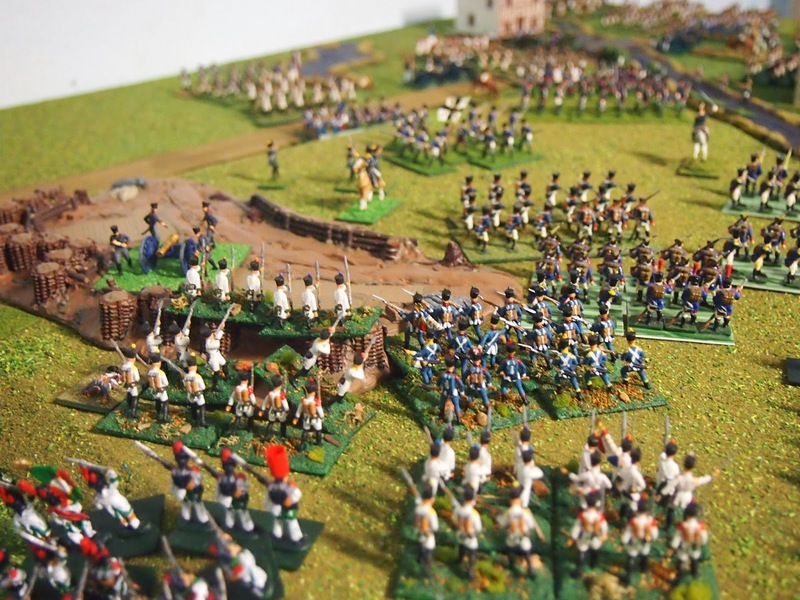 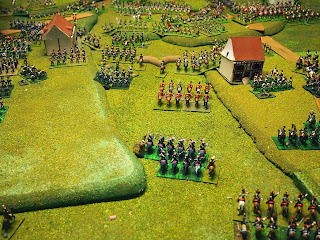 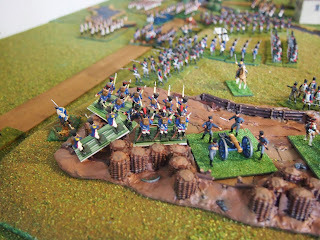 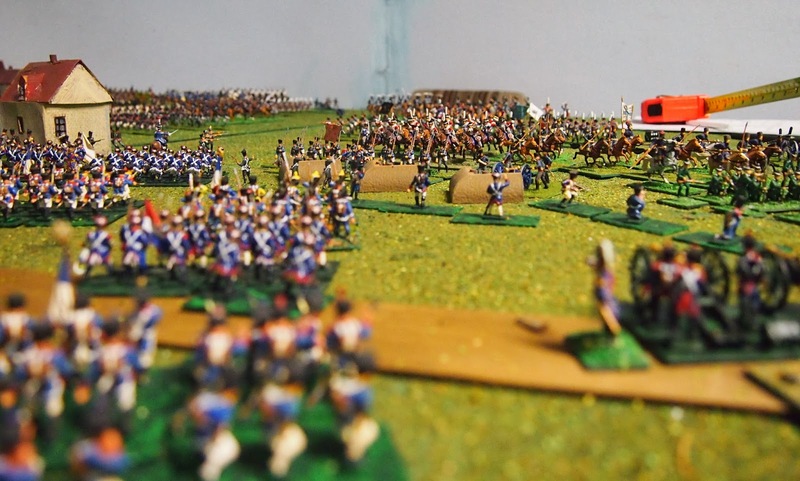 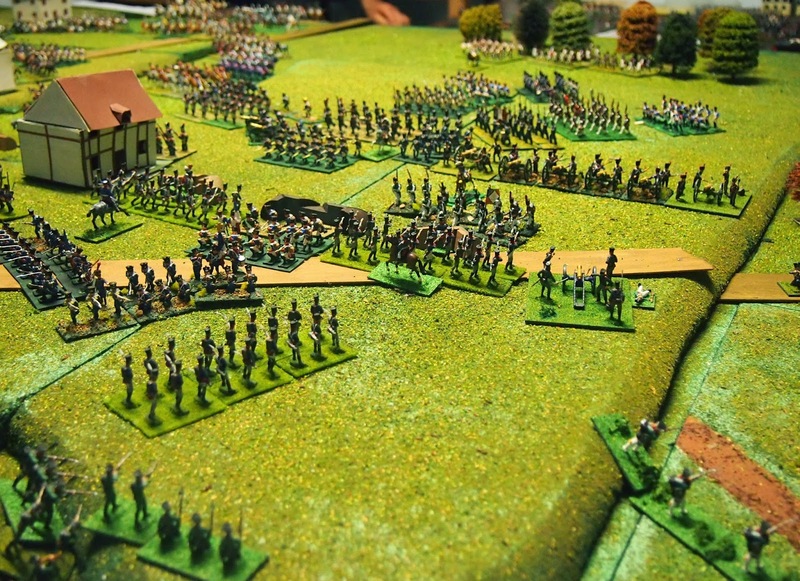 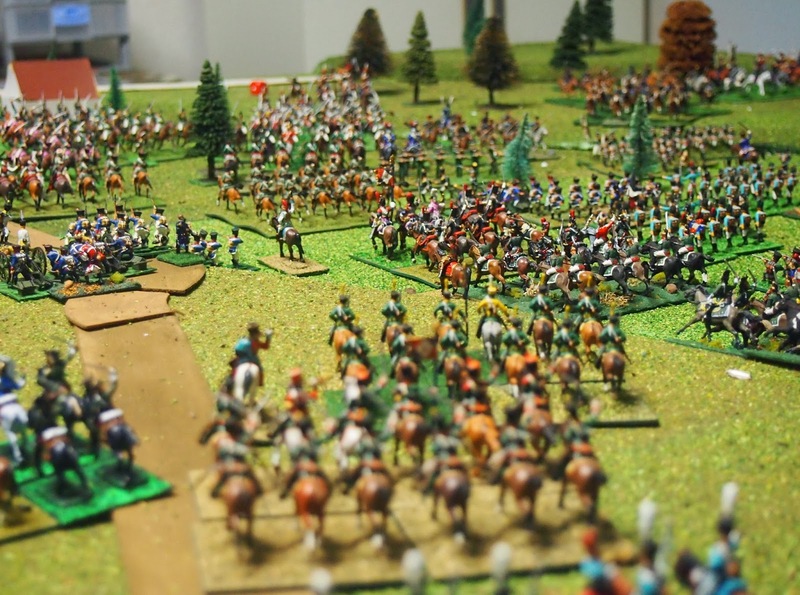 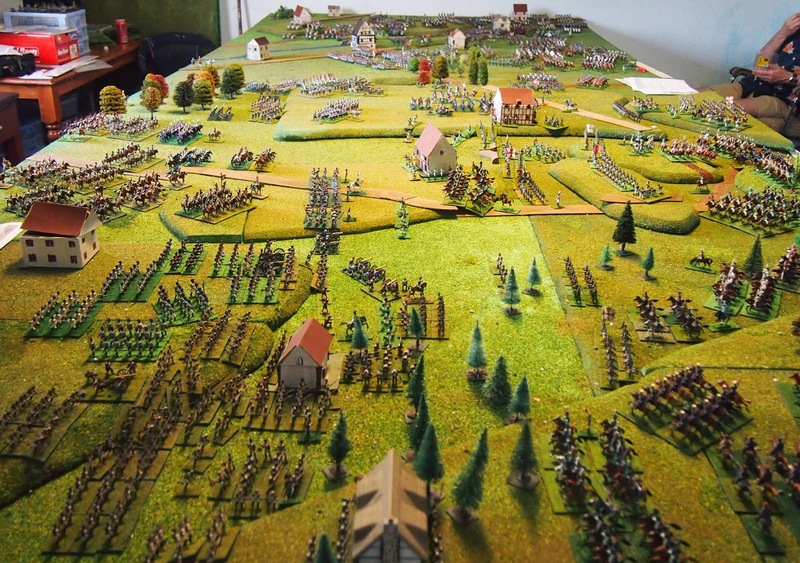 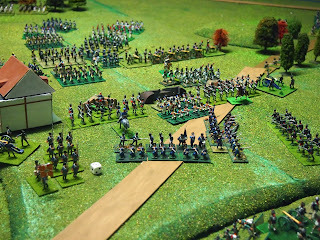 Above and below, Preititz was taken by Souham's troops from Ney's IV Corps who easily accounted for Insov's small division, two units strong, that Barclay de Tolly had left in the town to cover the Prussians northern flank. 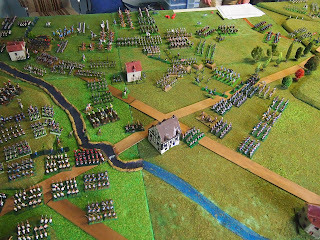 This caused von Klüx's and von Dolffs cavalry to turn to meet the threat. 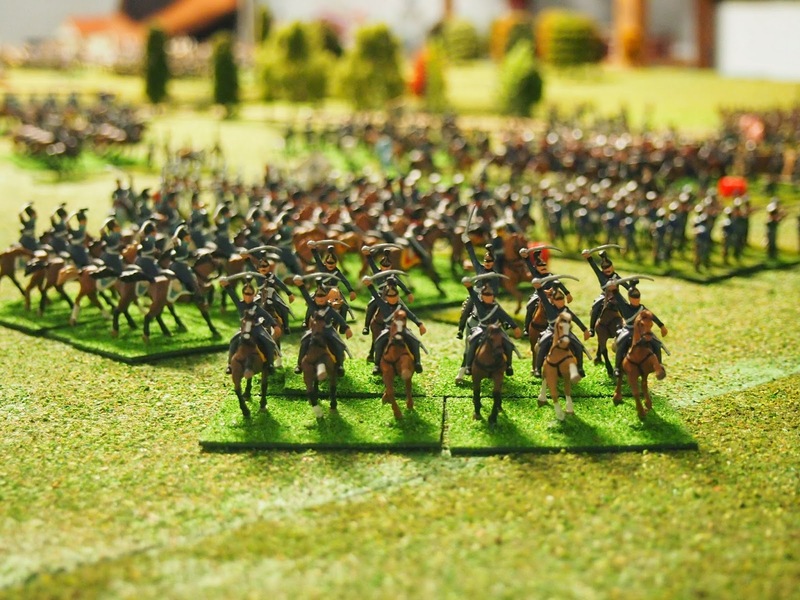 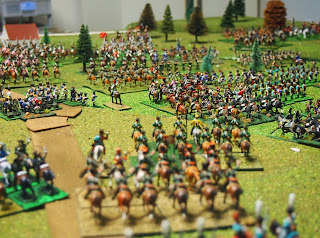 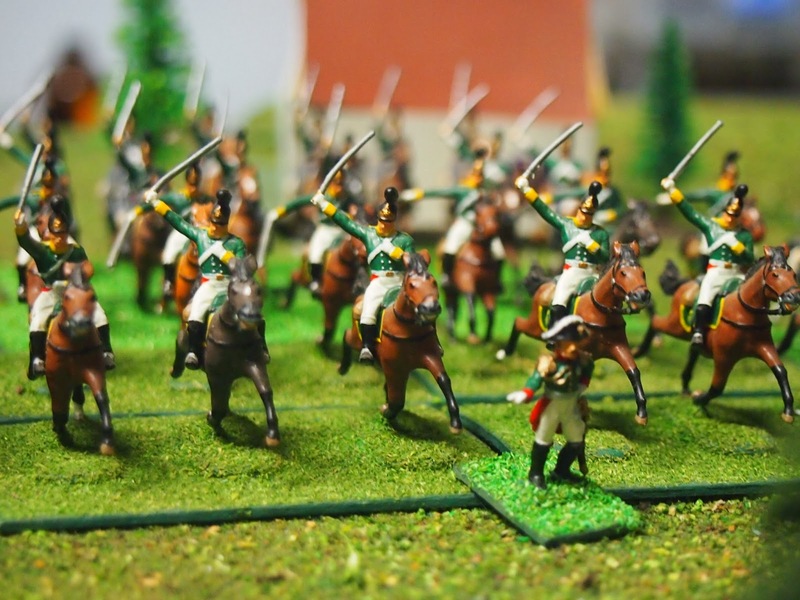 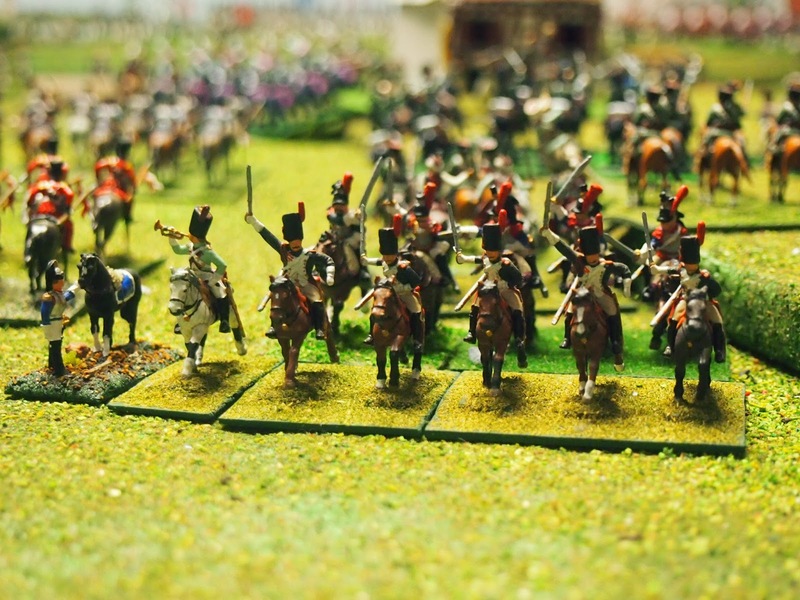 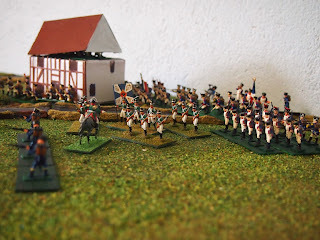 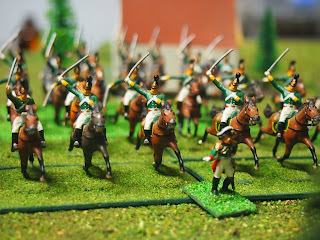 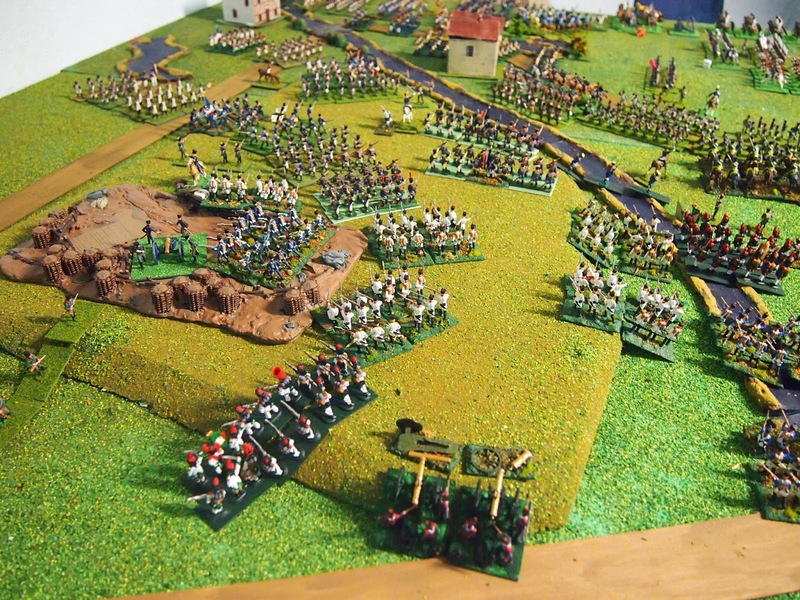 —yes, the Croatians should be in brown coats in this campaign, but I painted the green uniformed unit for Borodino and was not gonna miss a chance to field them again, even if I did handle them so poorly! 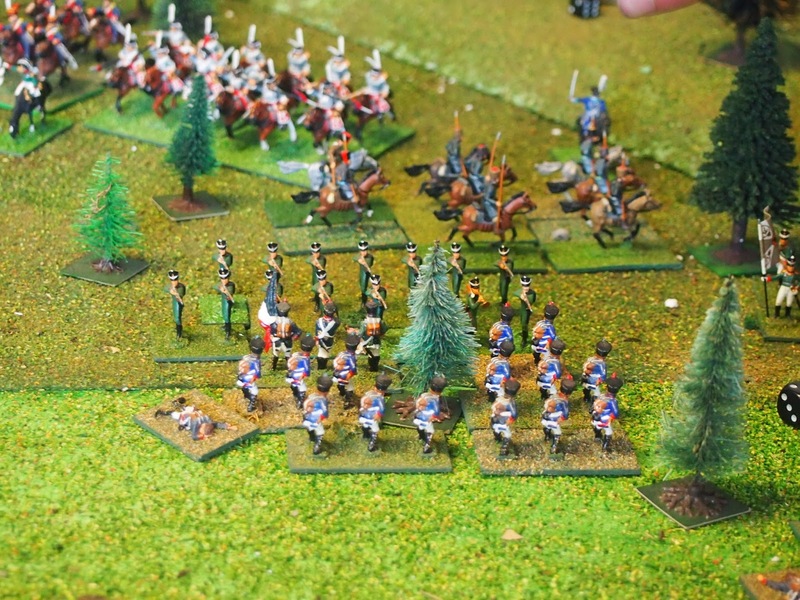 Cossacks! 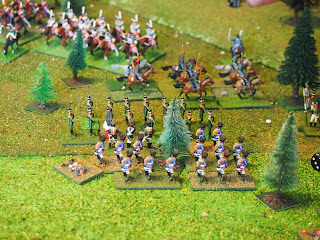 Lurking in the woods waiting for the right opportunity, Emmanuel's Cossacks fell upon the lead unit of Pacthod's division (Oudinot's Corps). Looking from the 'south' at the end of the 11:30 turn. 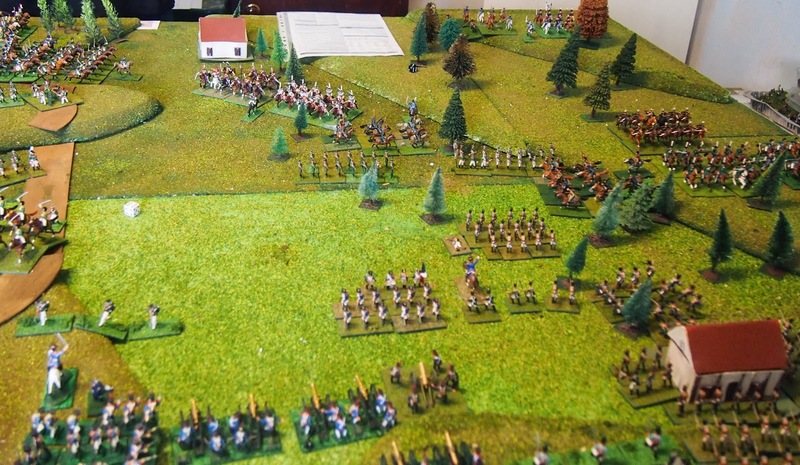 achieving a break-through in the redoubt defended by Zielinsky's brigade (Yorck's II Korps). 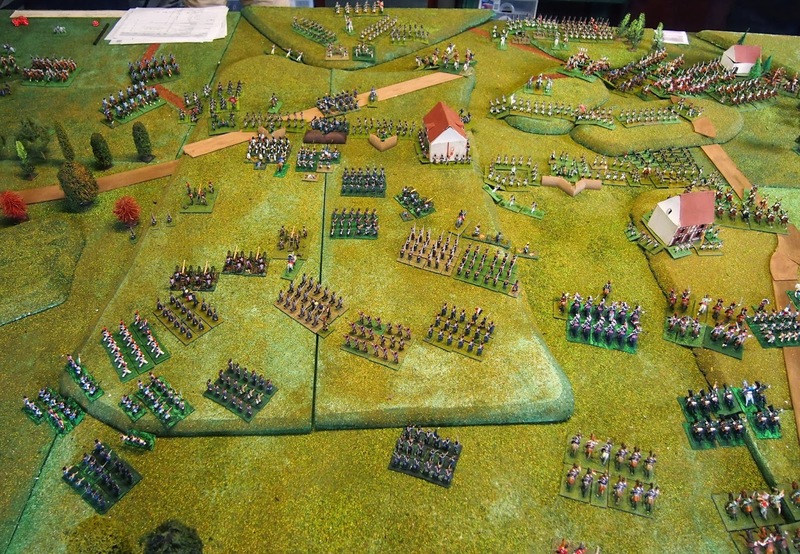 and the two divisions of Young Guard. 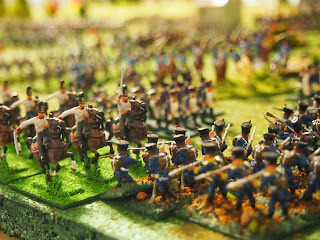 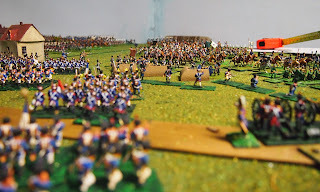 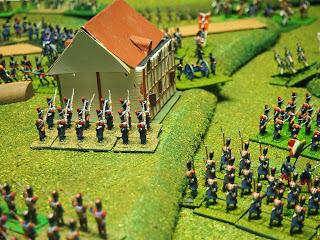 Back in the north, Bertrand sent his attack in force and began to overwhelm Ziethen's brigade on the Kreckwitz Heights. The 2/1st West Prussian Infantry of von Klux's brigade held Litten, driving back Franquemont's Württembergers. 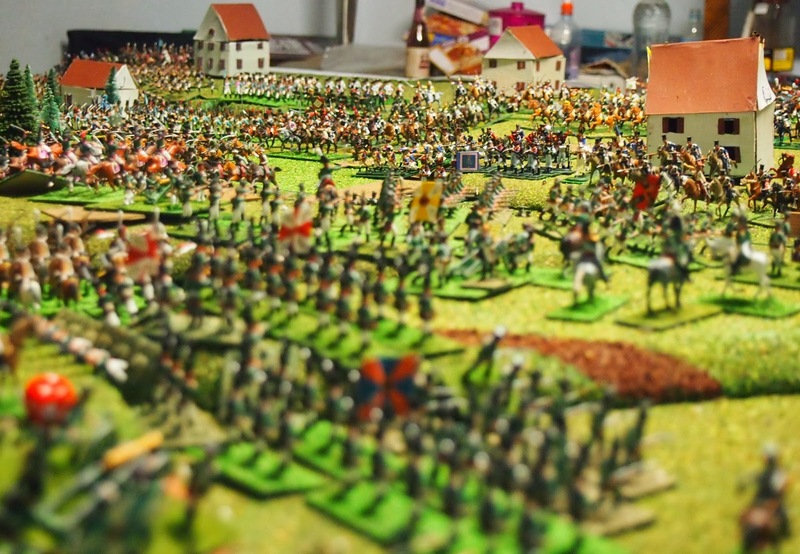 but numbers were beginning to tell. The men of Compans' division, also from Marmont's corps secured the breakthrough against Yorck's lead brigade (Zielinsky). 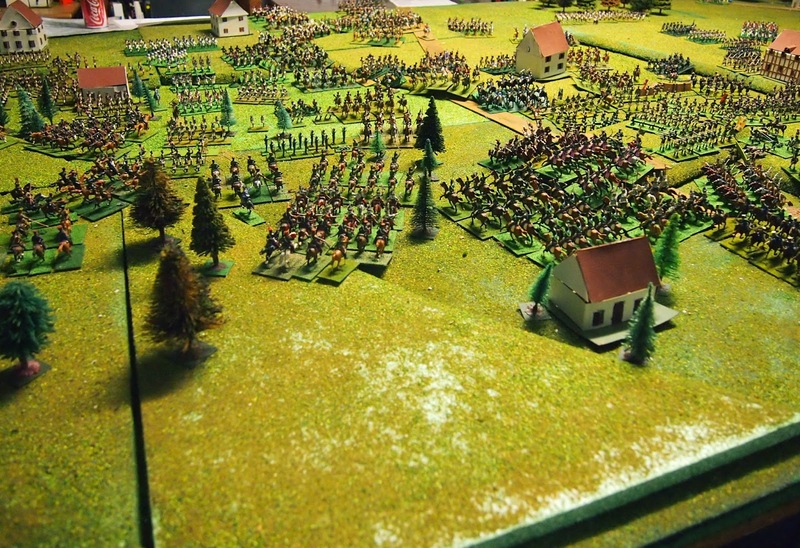 Following those successes, came a series of set-backs for the French-allied attackers. 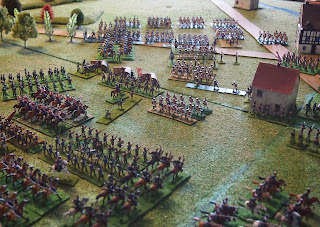 The 1/23e ligne (Morand's division, Bertrand's corps) attacked a juicy looking flank belonging to the 2/2nd Silesian Infantry, but, being fired upon in their rear by several companies of schützen (I preferred to replace the u with an i for those fellas! 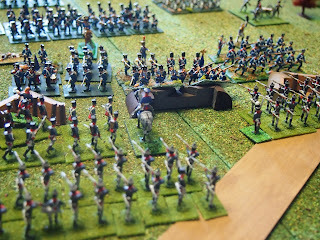 ), they broke. who with a cry of“remember Golymin”! 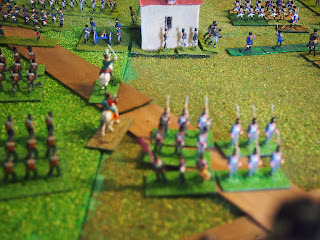 bested the “Big Heels” younger brothers. 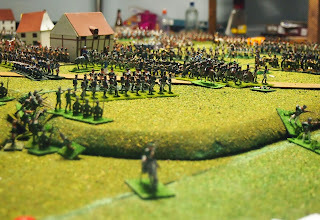 The last stand of von Ziethen's dogged brigade. 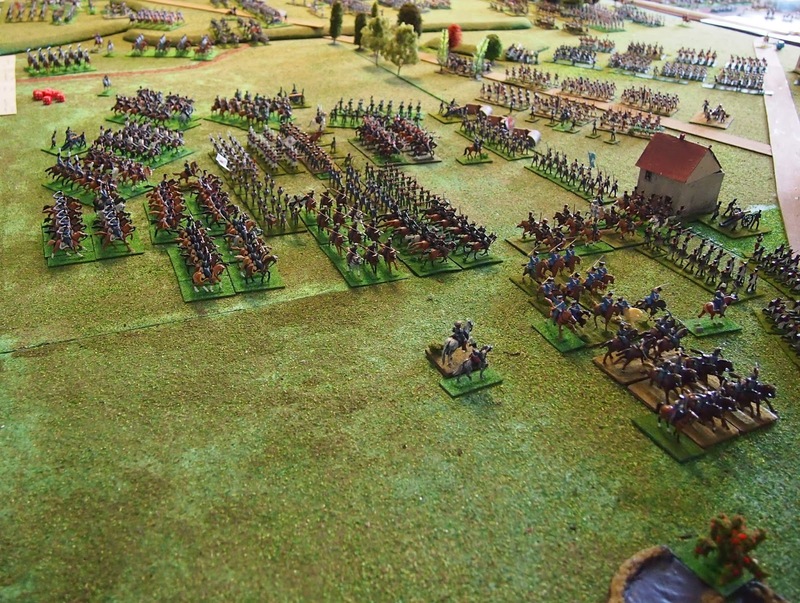 but Berg's cavalry gathered for a counter-attack. with Compans and Friederichs pressuring von Klüx's adjacent brigade. 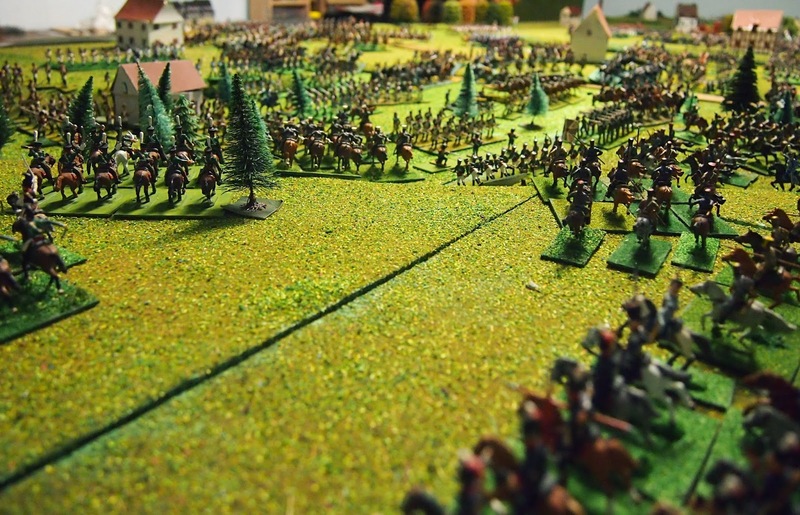 The 'hottest' fighting was in the centre with Yorck's line pierced around Baschütz and Jenkwitz and massed cavalry mêlées in the valley to the south of the towns. 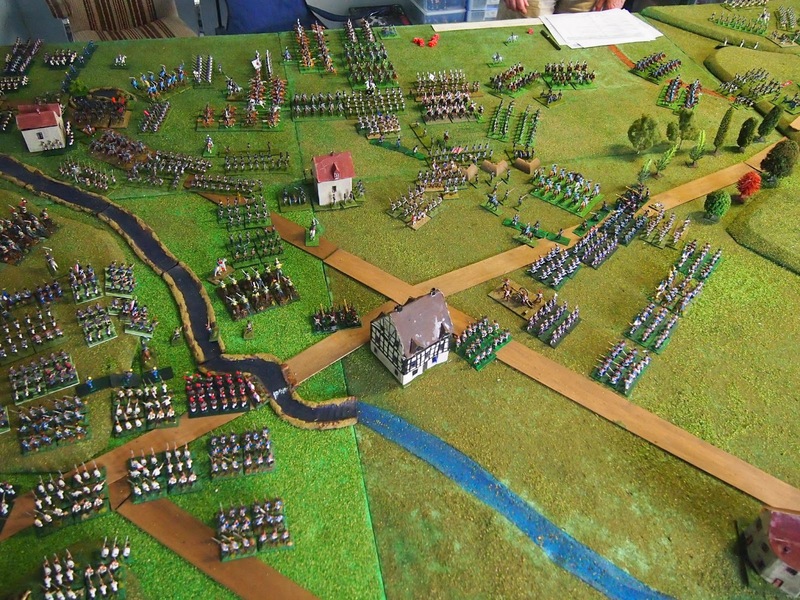 The allied army was almost split in half. 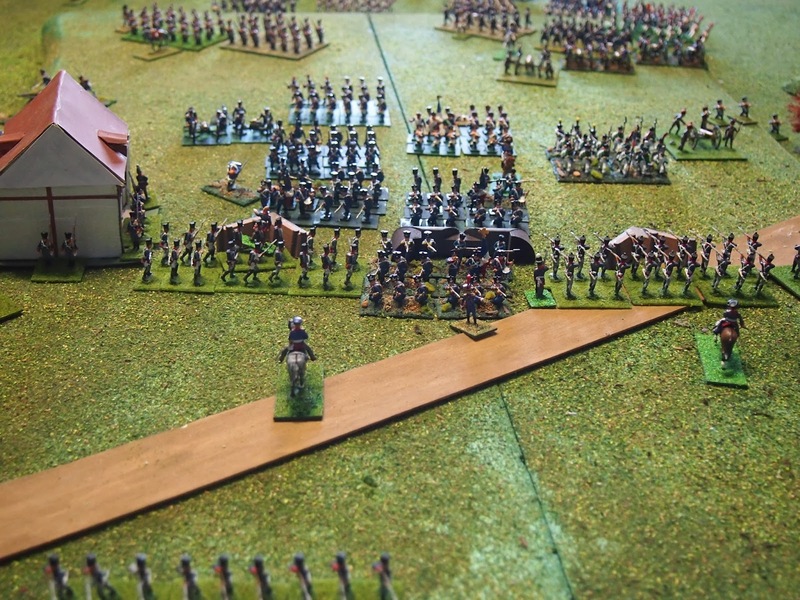 Dolff's powerful Prussian Guard cavalry turned to face the onslaught from Ney's advancing divisions. 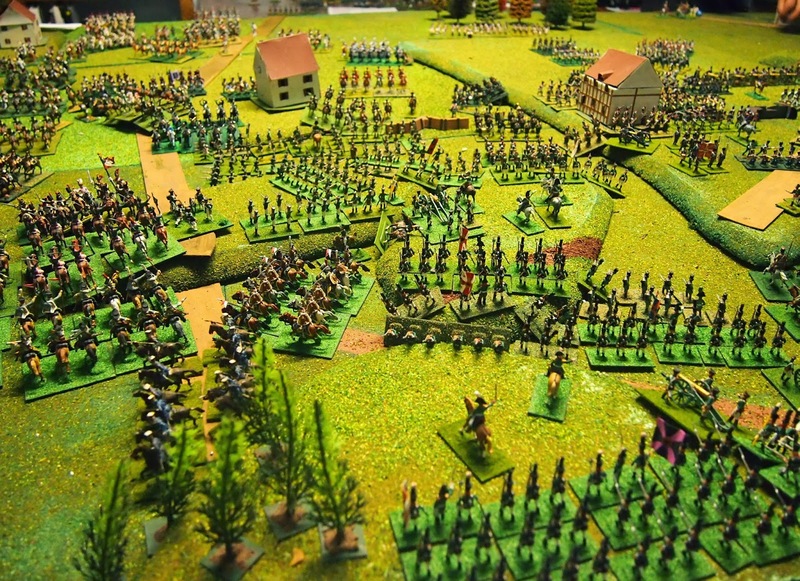 Klüx's brigade continued to hold off the divisions of VI Corps. 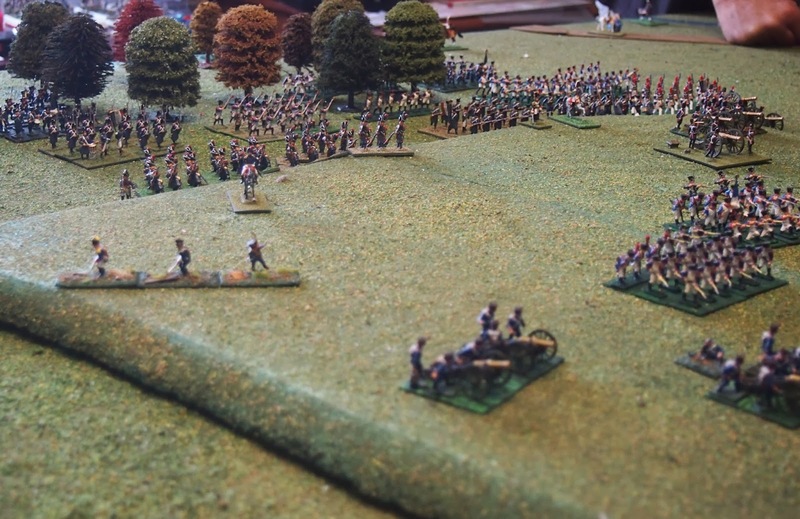 but Kleist's position was being overrun as the Guard artillery opened fire. 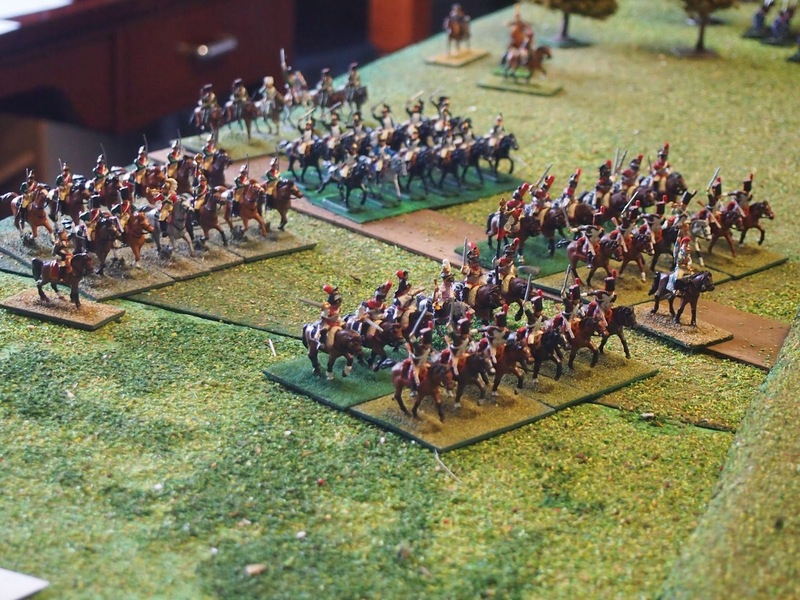 The French Imperial Guard cavalry continued to struggle against Berg's Russian dragoons and light cavalry, the Moscow dragoons defeating the grenadiers à cheval! 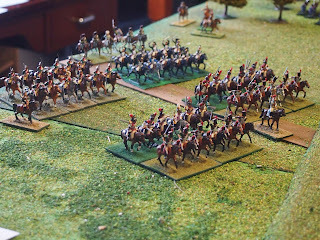 and help was arriving in the form of Latour-Maubourg's reserve cavalry. 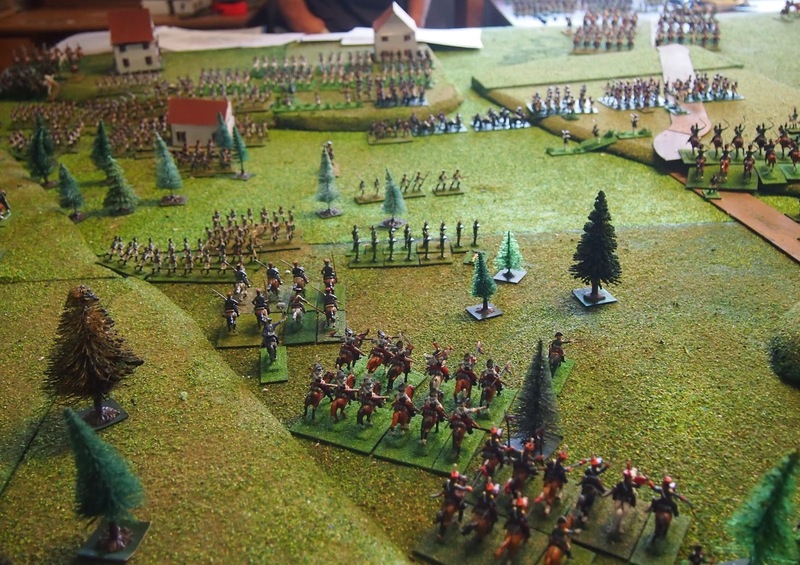 It’s hard to beat a view like this, I reckon: Jenkwitz in the right foreground, Rabitz ‘centre-rear’, Jesnitz furthest from camera and Rieschen in the valley. 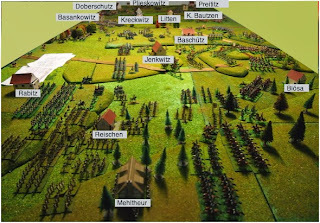 From the centre looking south-west, Baschütz in the middle of the photo, Jenkwitz beyond that and the ‘quadrilateral’ formed by Rabitz, Jesnitz, Mehltheuer and Rieschen in the distance. 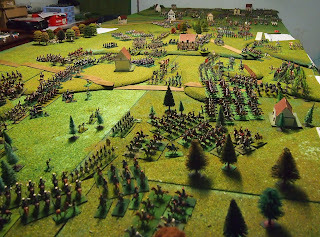 The south-west of the battlefield where Oudinot’s corps, as ordered, halted it’s advance at the edge of the woods of the Bohemian foothills, firmly ensconced in Mehltheuer and Rieschen. Beyond them, the French Imperial Guard cavalry, with Latour-Maubourg’s horsemen coming up in support, are in battle with Berg’s cavalry division. 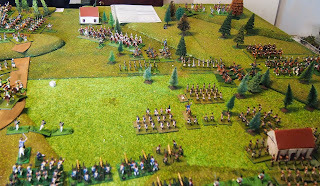 View at end of the Part Two. 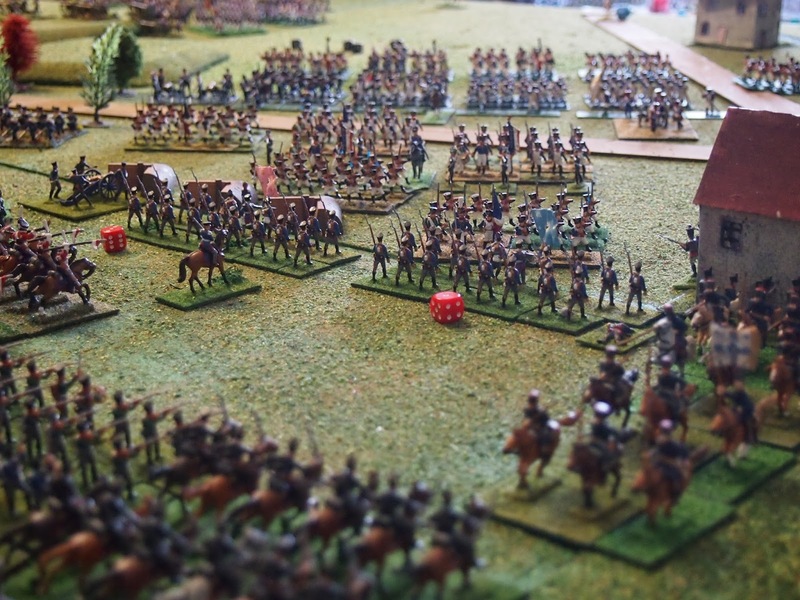 We concluded Part Two at the end of the 17th turn, 15:00. 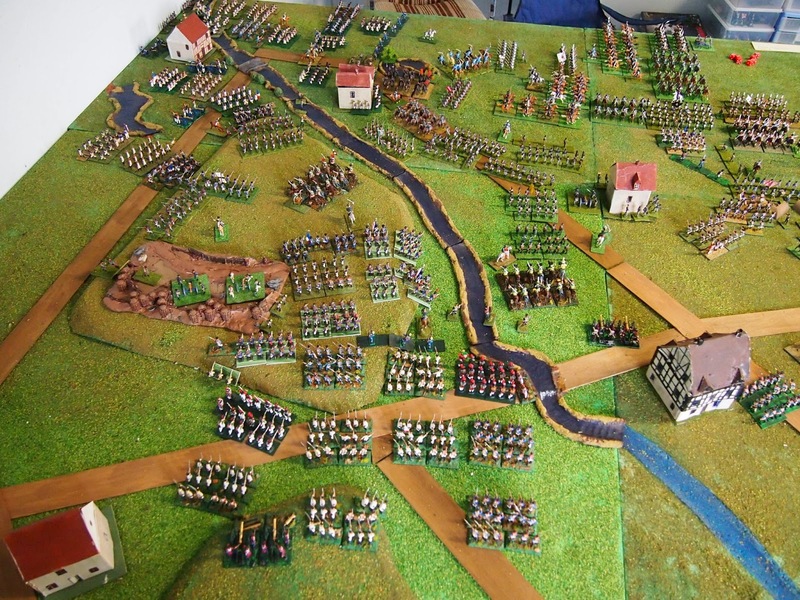 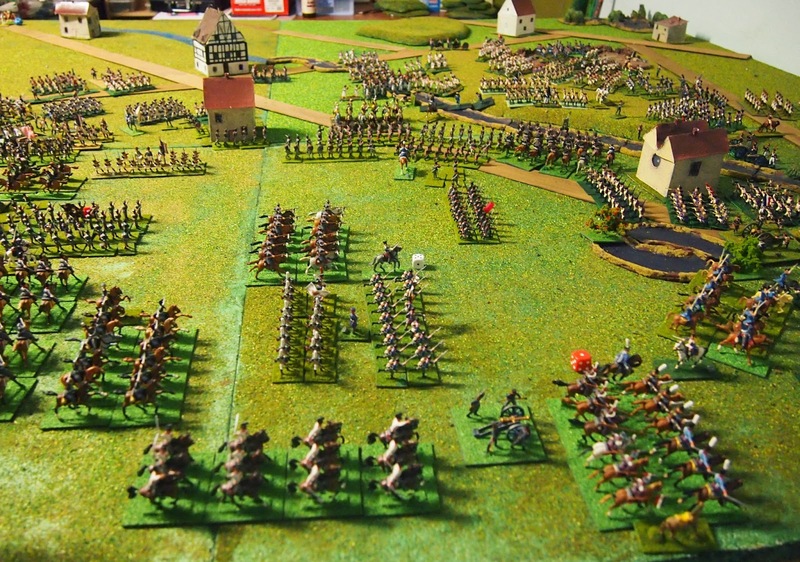 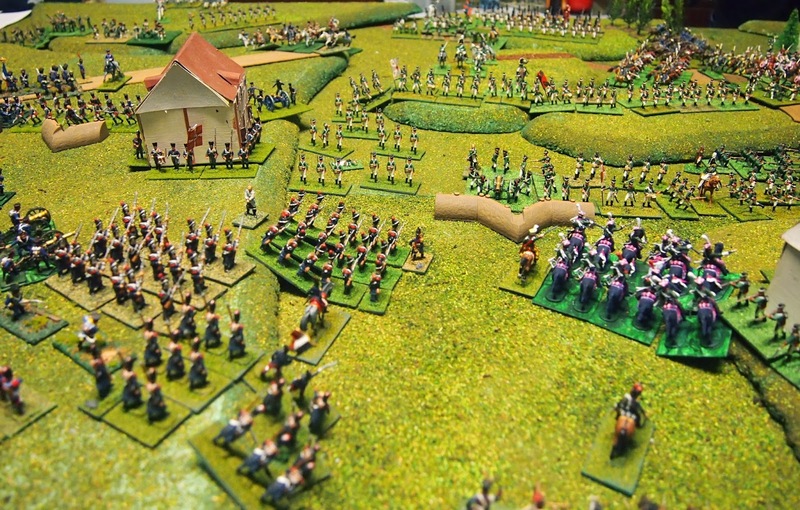 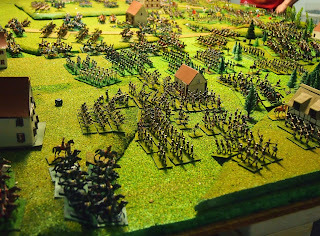 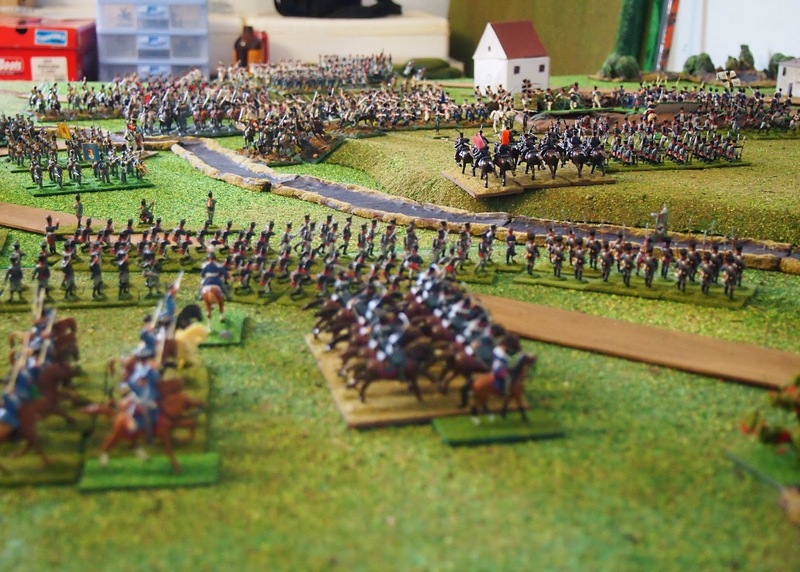 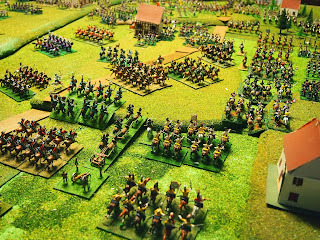 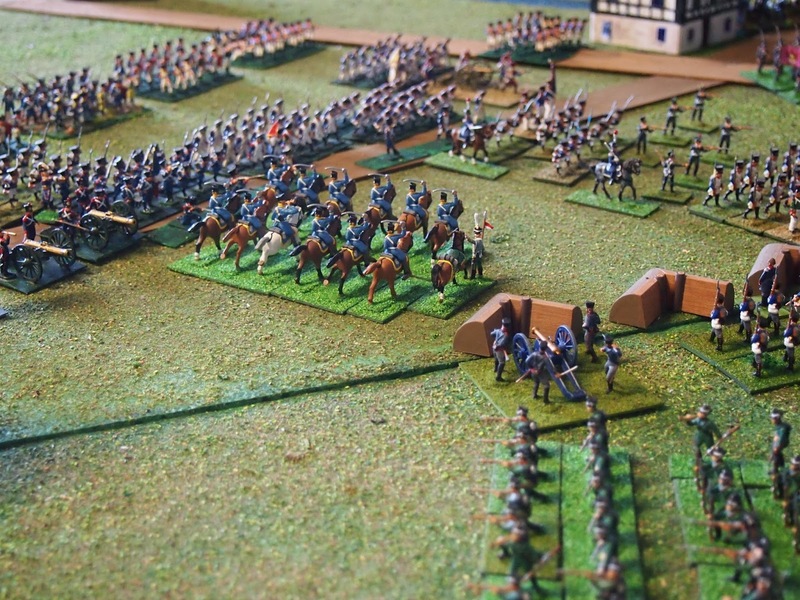 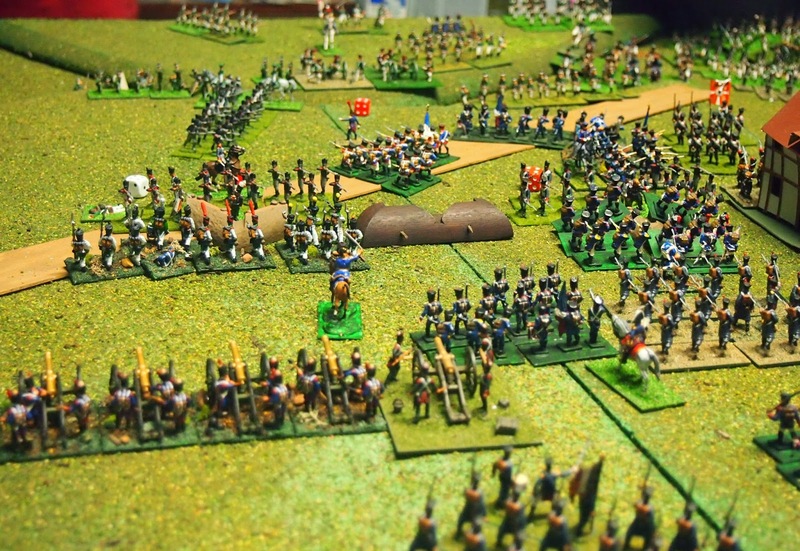 The eventual ‘breaking’ of von Zeithen's brave brigade gave Bertrand’s corps control of the Kreckwitz Heights. In the centre the Young Guard has control of the redoubt around Baschütz, with von Yorck's and, further south, Berg's commands feeling the pressure. The fight in the woods to the south continued slowly. The Russo-Prussians are running short of infantry, but have plenty of cavalry, especially in the north; although superiority in that arm has swung to the French-Allied forces with the arrival of small divisions of Latour-Maubourg’s corps. Importantly, the Russo-Prussian army has become hemmed in along a line to the east of the central 'line' of towns, which are nearly all in French-Allied hands. 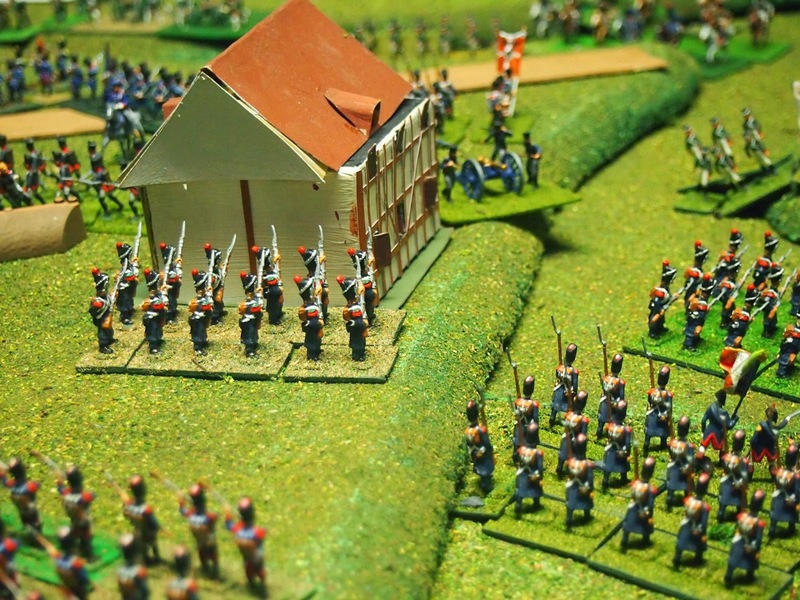 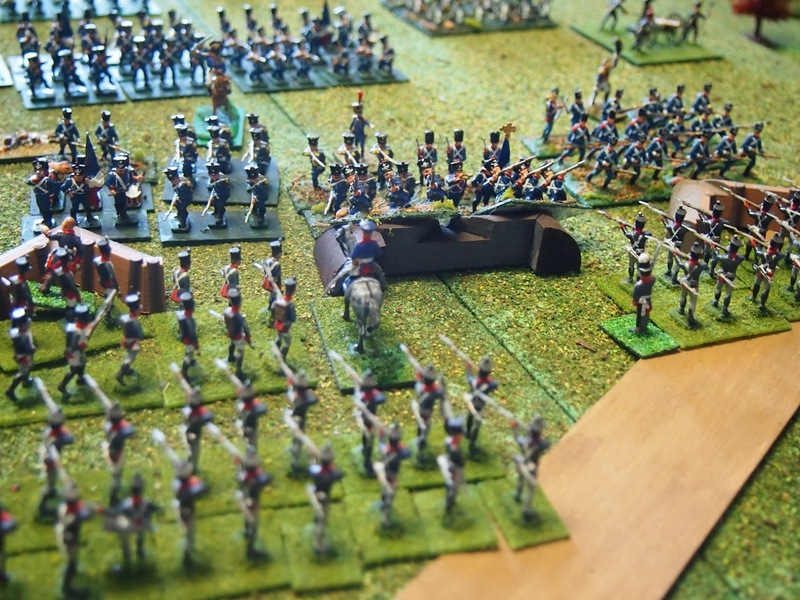 The one exception is Litten held tenaciously by the 2/1st West Prussian Infantry, having driven off four attacks from Franquemont's Württembergers and a further two from units of Compans' division. 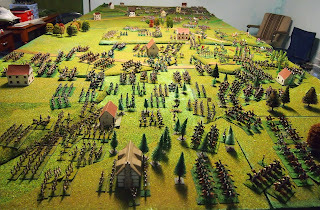 I estimate that the current victory points stand at 144 for the Russo-Prussian (104 from French-Allied losses plus 40 for holding Litten), while the French-allied have 177 (57 for Russo-Prussian losses and 120 for holding Mehltheuer, Baschütz and Preititz. 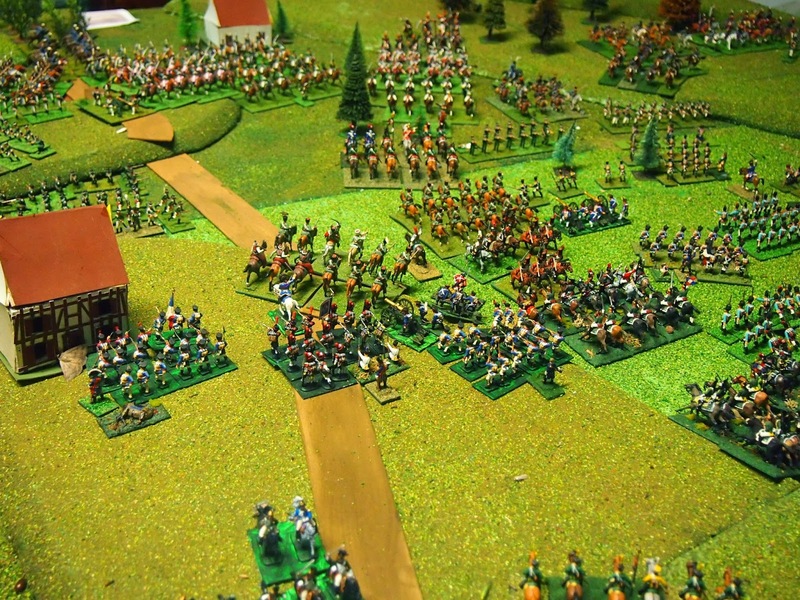 this gives a difference of 33, which is a draw result. 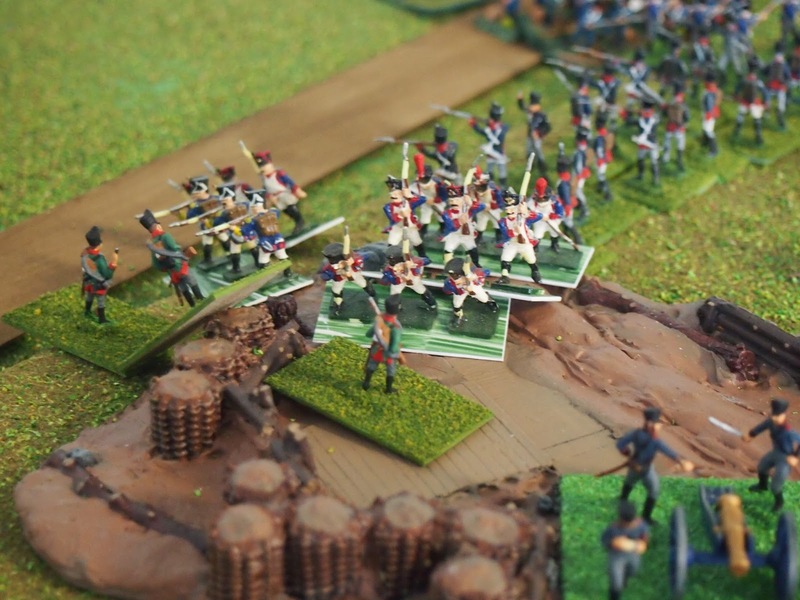 So, the game is evenly poised for us to take it to ultimate completion in Part Three. Will the powerful Russian reserves come onto the table in time to change the balance, or perhaps just to cover the retreat (ha, ha!). 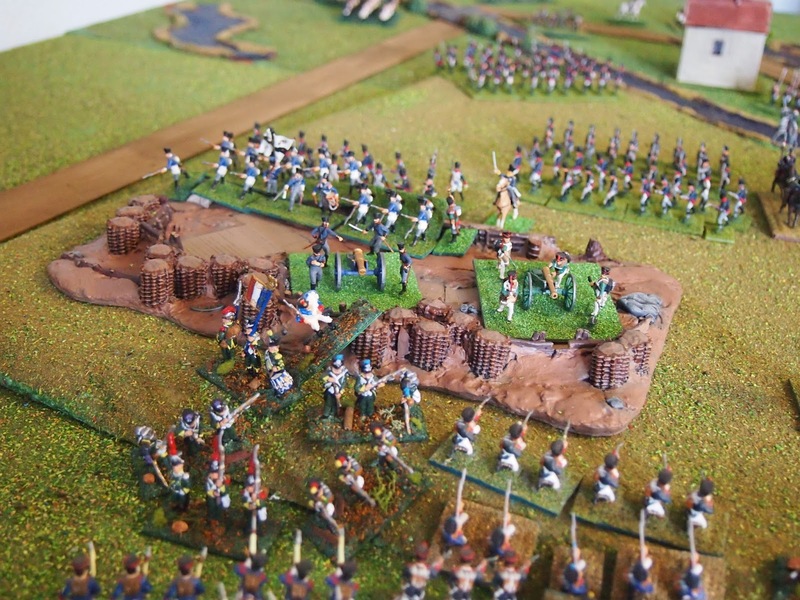 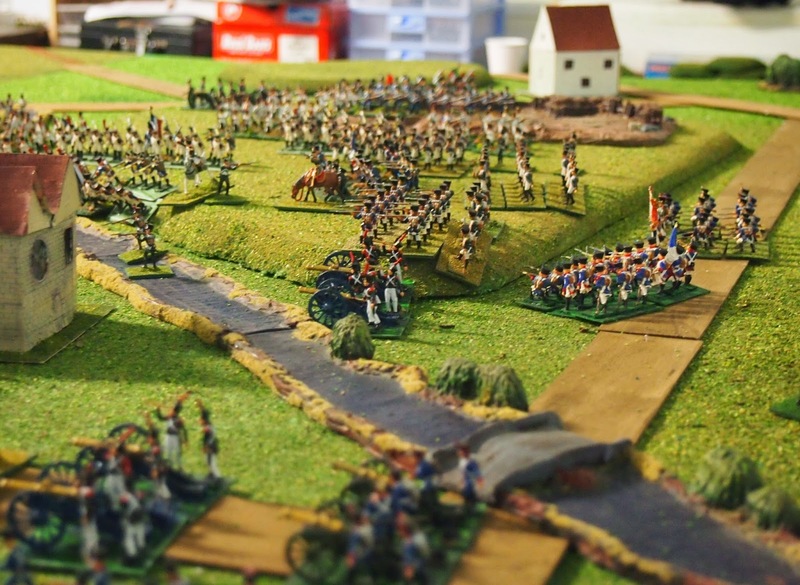 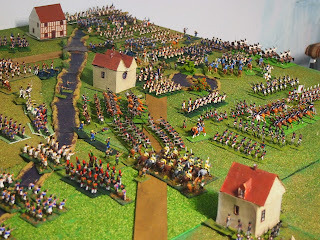 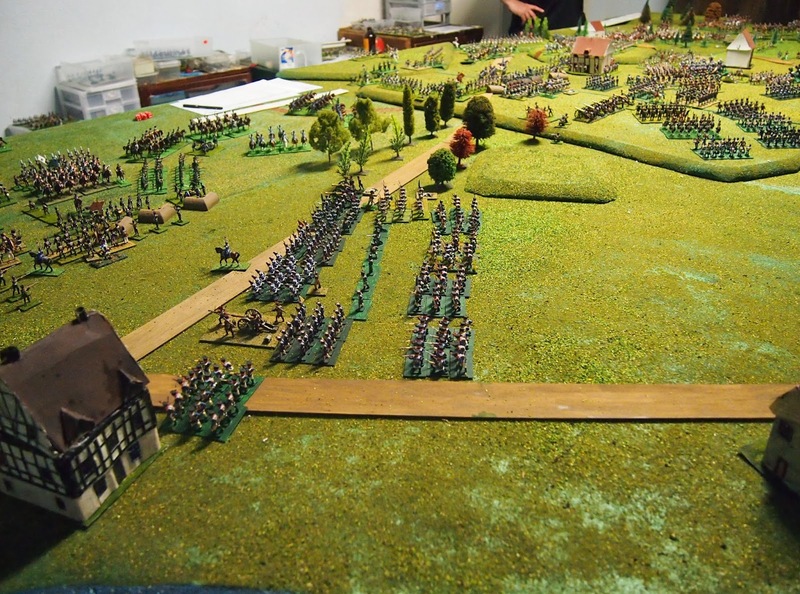 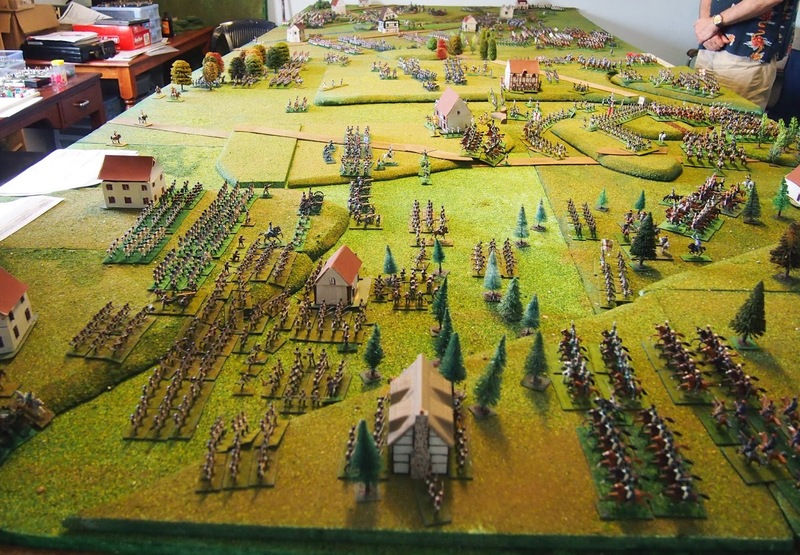 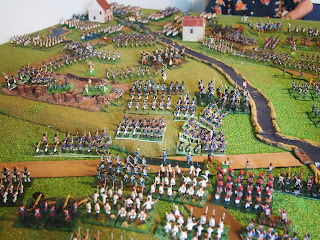 There is still a lot of interest in this game for the Russian and Prussian players to either prevent or to limit a French-Allied victory and/or conduct an orderly retirement and for the French-allied forces to try to push for a sizeable victory. 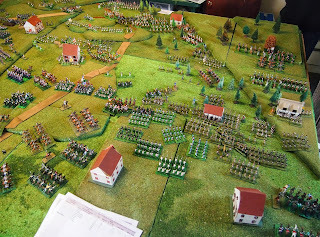 Great write-up and photos. 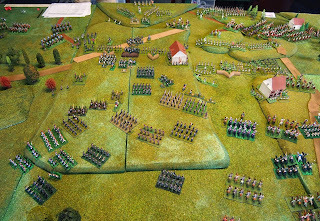 Just a pity I couldn't have stayed for longer, or make the third day. 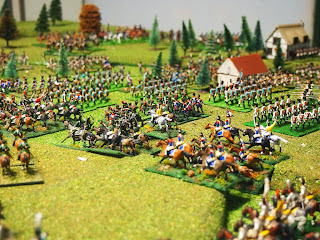 Big game! 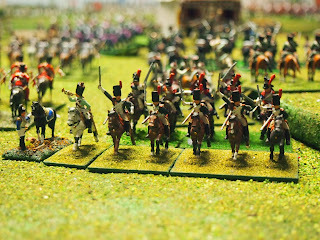 All the best for Part 3. 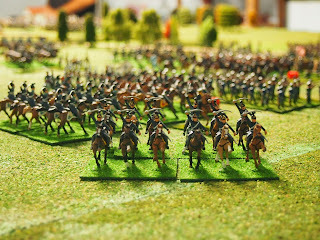 Great looking game! Thanks for the report! 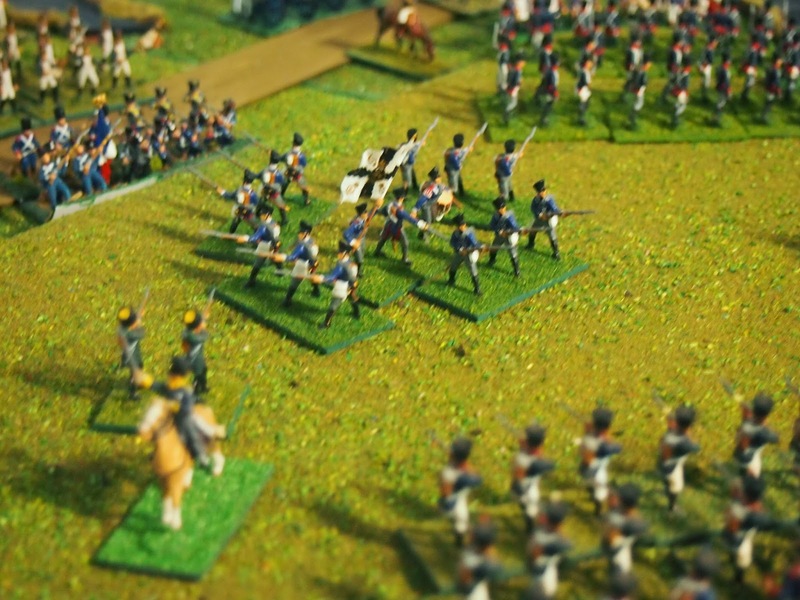 Impressive and beautiful game, James. 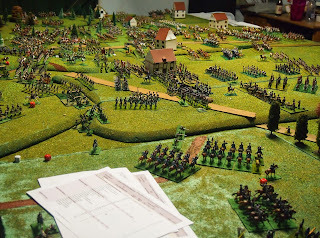 looks like there was plenty of interesting action despite the loaded up table! 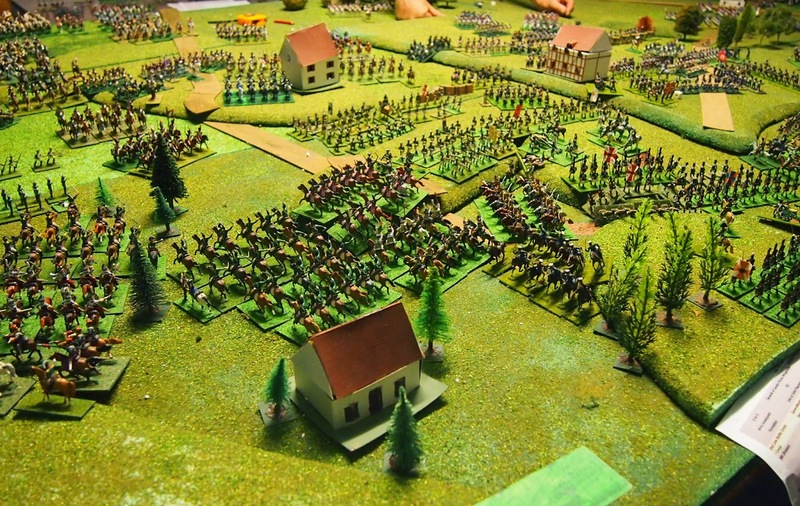 How many troops were there involved in this one? - looks like a heck of a lot. 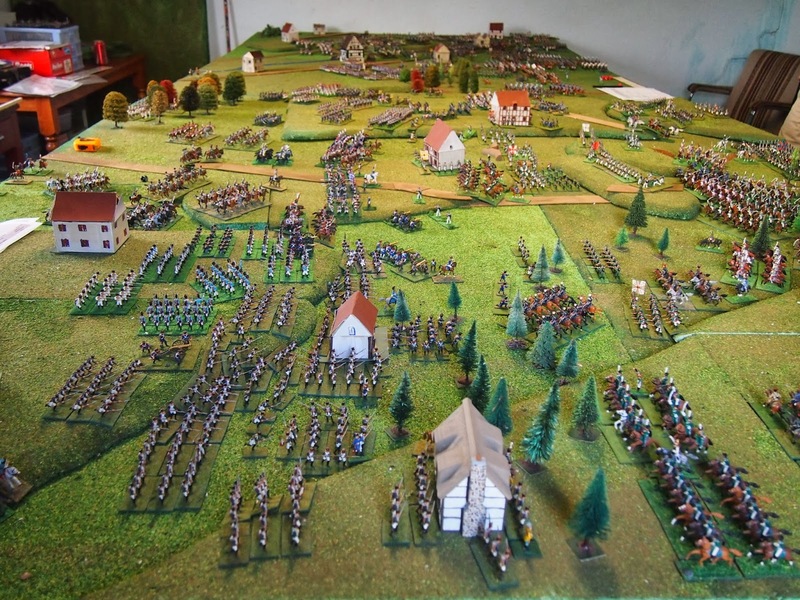 This fine display of Wargames Megalomania makes mne consider another stab at Bautzen myself once we get past Waterloo, etc in 2015! Thanks Gents, for those kind and encouraging comments. 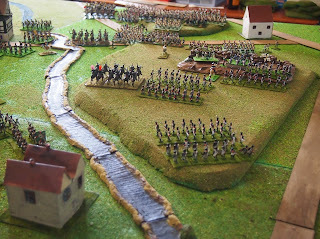 Ian, never say never; think of all the barmy's out here at present, ha ha! 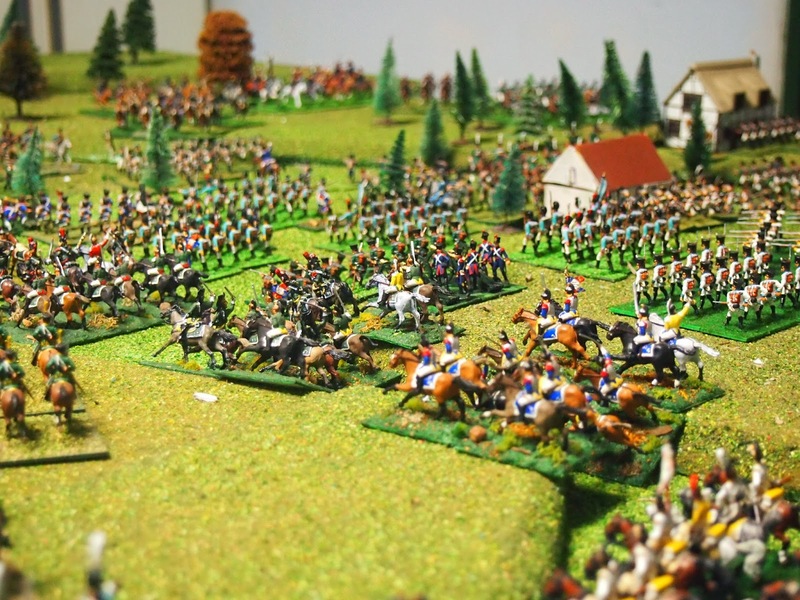 We've delayed Leipzig until 2016, so let's make some plans!! Fog of war Peter. 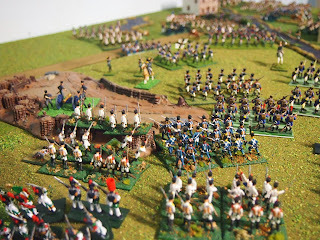 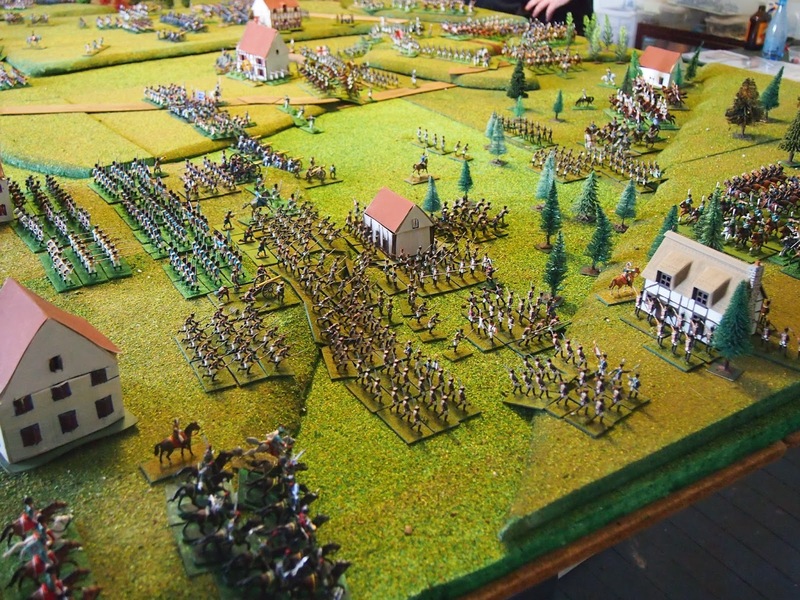 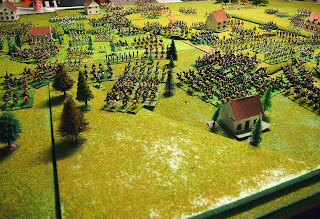 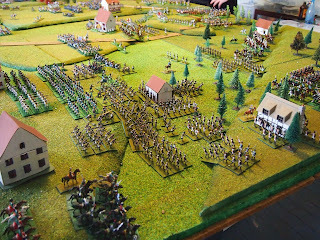 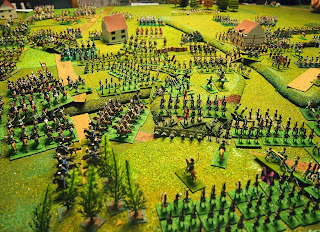 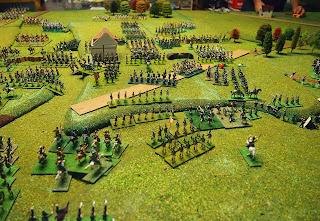 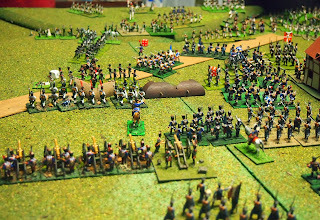 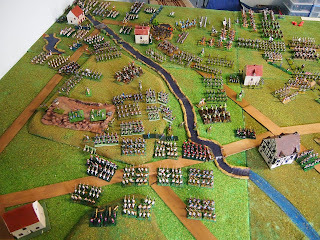 I don't have a proper count for you, because we did not get Barclay's force and the French in the far north onto the table (they were out of the main action), plus not all of the troops are on the table at once. 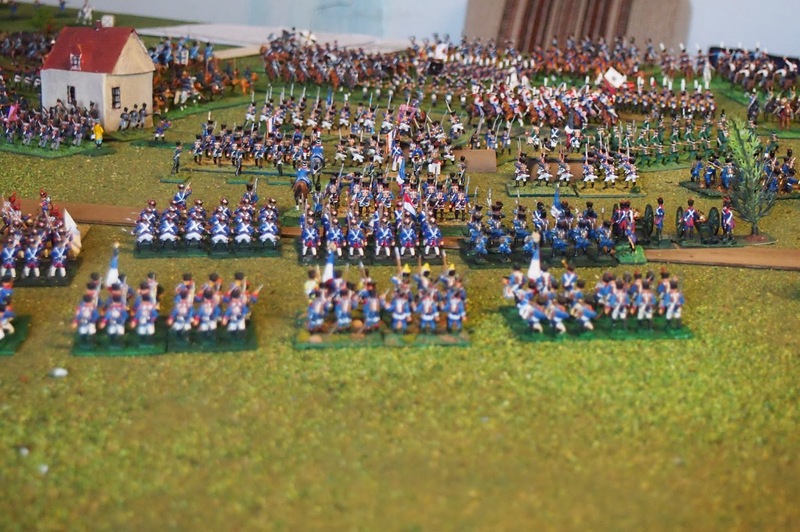 The totals are something like French-allied 2 800 infantry figs, 350 cav figs and Russo-Prussian 1500 infantry figs and 600 cav figs, so the sig. 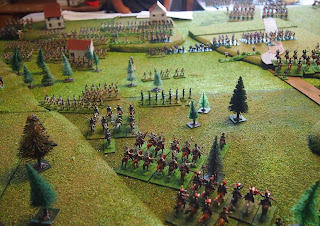 numerical advantage to the French-allied is there, as is now evident on the table.